Clusters of traditional but contemporary huts scatter across 60 acres of pristine forest land. Designs range from traditional village houses to a tree house, all constructed with natural materials sourced locally, such as wattle and daub and thatching. Each structure is designed with comfort and relaxation in mind. Whilst all the layouts differ, the facilities are essentially the same: all the huts have outdoor showers and indoor ­­sinks and western toilets, designed in a style that befits the overall aesthetic and back-to-nature theme. There is an adjacent lake which is great for swimming and bathing. 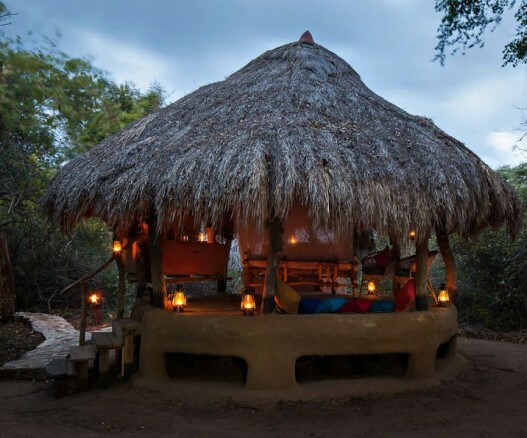 All huts have dining areas and spaces which can be used for yoga and meditation. NB: There is no mains electricity at The Mudhouse and lighting is provided by candles and lanterns. The staff hut is equipped with solar panels and has a limited supply of both AC and DC power for charging batteries.